Many users who use happings.com for promote your own events, you ask how effective the tool, how many people will be able to achieve, because time, what is the target audience etc. Sometimes users tend to use the "easy way" and for example to rely on a single social, using also the sponsoring: the limitation to only use a channel is obvious, especially when this channel requires registration to view the content. Often falls into the trap of promoting events always the same people indeed that focus and undertake to communicate to ever new users. instead that delve into explanations on statistics of "our" visits, we have developed a winning strategy to guide you every step of the way to make the best marketing to "your" event. Begin with specify that to effectively promote the event, the first step consists in the create a Landing Page (landing page) that encloses all the information on the event. It is called the landing page why is the page accessed when you click on the link (advertising, sharing, an e-mail, etc.). For example the link Www.happings.com/it/toscana.html "lands" on page "Events in Tuscany". Happings offers this opportunity, completely free, To create a landing page complete and unlike the social networking sites such as Facebook pages are public (i.e. do not require registration to be displayed) for which can be choose apply as link to share in their social. 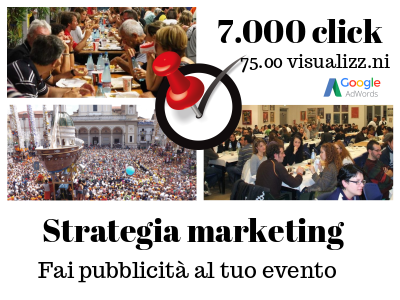 To create the page of an event is enough to register and click on the button "Pubblica a happing. Follow the wizard and the page will be created in a few steps. Once you have created the page of landing, this can be shared on all our pages social, sent via email to our friends, etc.. To share it is sufficient to use the buttons page sharing, or, alternatively, simply copy the address of the page from the address bar (for example Https://www.happings.com/it/toscana.html) and paste it on the profiles facebook, twitter, google+, instagram etc. The posts created on social, with the shared address, are read by our friends and friends of friends, generating a viral effect. At this point the event will be searchable Happings on, will be displayed on the map during the period of execution and will be visited by all those who clicked on the link shared for more information. If you want promote the event to a public considerably larger, you can create an advertising campaign ad hoc. Since you have the landing page on happings.com, you can advertise on social sponsoring the post on FB or Tweet on Twitter (incorporating the link to event). We suggest you create a Campaign Google specifies to be displayed in the search results of the search engine and especially for Have the poster of your event (banner) displayed while you surf the web, on sites that host Google advertising. We offer you aamazing opportunity To be able to reach an impressive number of new contacts to your event, we are not trying to convince you on staticstiche of visits of Happings but, in that ye have builded you an advertising campaign on Google (of which we will provide you with all the details of the statistics on visits). How does it work? We offer of settarvi a campaign on Google the value of 100 €, making you pay for only the 100€ of credit Google. The 100€ of advertising on the network display of Google, you will obtain on average about 75,000 Views and about 7,000 click.Our gain comes from partnership with Google that allows us to pay 100€ a little less. Consider that on average the problem of costrutire an advertising campaign on Google is composed of two main factors, i.e. have a landing page and set the campaign (service quite expensive offered by web agency or consultants). All the service setting and reporting of the first campaign will be completely free. against 100€ of payment to Happings you will receive a voucher of 100€ "Prepaid" Google. If you are interested please contact us at 3315809499 (even whatsapp) or to email address Customers@happings.com. In little time your campaign will be live and you can extend considerably the audience of people interested in your event. The credit of Google is scaled by the click the actual announcement (each time that a user click on the announcement, the credit decreases to a value called the cost of clicks).